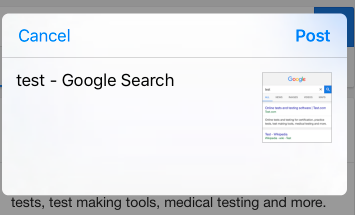 As I mentioned in my previous blog on action extensions I was creating a replica of the default Apple notes application which also included creating a share extension that would allow my notes app to accept URLs and text from within other apps. The main challenge here is that I wanted my share extension to be able to create or add to my existing notes that are being saved in CoreData. I did quite a bit of looking online and never really found a great example of what I was trying to do. Some of them included a way of using NotificationCenter within your CoreDataStack’s init and using that to pass data, but I found a way that is much easier and seems to work great! Share Extensions, like all others, are basically their own application, however they need to be included as part of a project instead of a stand alone one. To make a share extension in a project go to File -> New -> Target and select Share Extension. As you can see it’s like it’s own little app within Safari. Going back to those three functions as you might have guessed didSelectPost() gets fired when you click on the post button. isContentValid() is actually checking to see if the content we are trying to share with our application is the proper type. This function determines whether or not the Post Button is enabled. Lastly the configurationItems() function is there to enable us to post our info to a specific object. In this example I want to be able to create or add to an existing note in my CustomNotes application via Core Data. Before we start writing code in our extension lets go back to my customNotes app to provide some context and start the process of sharing my coreData with my extension. Now everything here looks pretty standard aside from something you may have noticed when I initialize my NSPersistentContainer. You can see that I’ve created my own custom container called CustomPersistentContainer. The reason I am doing this is because I want to set the directory url to that of my app group. 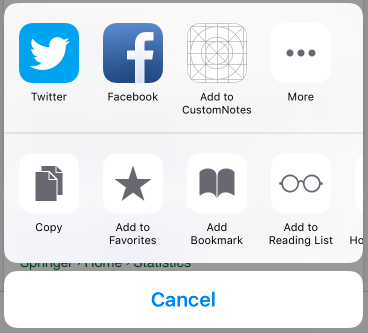 This is important to allow my share extension and my application to store data in the same location. One last thing before we got back to our extension is we want to add our extension to our NotesModel’s Target Membership which you can see when you select your model and open the utilities inspector. Just check the box and the magic happens. Doing this replaces the need to Notifications or other methods people use to link the core data. Now in this example I simply want to allow my notes app to accept URLs and text. The first step here is to go into your extension’s plist file and change the NSExtensionActivationRule to a dictionary and then add NSExtensionActivationSupportsWebPageWithMaxCount as a Number with a value of 1 and NSExtensionActivationSupportsText as a Boolean with a value of YES. Also while we are here you can change the Bundle display name to whatever you want as this name is what actually shows up when the activity controller is set. Now in our ShareViewController let’s create a few variables to hold onto our data. For one thing I want a variable to hold onto my url info, in my example I just want the url as a String. Also if I’m just trying to share text I want a variable to hold onto whatever that text is. Now that we have our content we want to post it, but where do we want to post it? To our CustomNotes app of course! Ultimately we want our extension to look like this when we open it to be able to choose from our existing notes or create a new note. 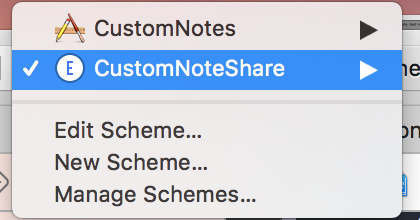 Do enable this little select note option on the bottom we need to play around with our configurationItem function, but we want to populate it with our notes from CoreData so lets add a few properties to our ShareViewController. One to store all our notes, one to create our instance of CoreDataStack and another to hold the value of the note we’ve selected to post to. 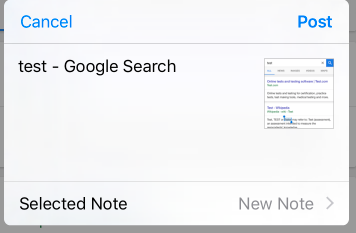 When we click on “New Note” above it will actually open up another viewController that allows us to select the note we want to add to. To do this we want to create another ViewController and since it’s going to be a list of current notes lets go ahead and make it a TableViewController. As you might have guessed in our tableview we can select the note we want to change, but we need to pass it back to our ShareViewController so let’s go ahead and create a protocol and have our ShareViewController conform to it. And now your share extension and application can communicate and work together!! I hope you found this helpful. If you have any further insight or questions please feel free to comment. I will say that while building this extension I came across an interesting issue where when someone was trying to add to an existing note in the extension and then opened the note app from the background and then went into that existing note it would not show the addition. To work around this instead of changing a note I would create a new note and delete the old one. You can see this on lines 12–20 on my didSelectPost.swift gist (2nd to last one posted).